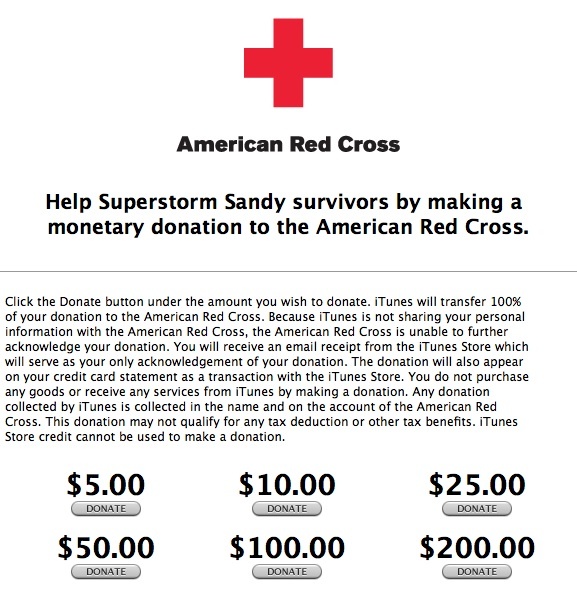 Apple has launched a new page on its iTunes Store allowing users to easily donate money to the American Red Cross toward Superstorm Sandy relief efforts. The donation page, which is accessible through the desktop iTunes Store as well as the iTunes and App Store apps on iOS, permits donations at the $5, $10, $25, $50, $100, and $200 levels. Apple will transfer 100% of each donation directly to the American Red Cross, allowing users to have their donations seamlessly billed to their existing iTunes Store accounts. With Apple currently holding over 400 million iTunes Store accounts with credit cards attached, the company has a very significant customer base that can take advantage of the donation program. Apple has conducted several similar campaigns in the past, most recently in March 2011 following the Japanese earthquake and tsunami and in January 2010 following the Haitian earthquakes. Update: Apple has now added a link to the iTunes Store donation page on the main apple.com page. The awkward moment when Apple has billions of liquid dollars and will not donate anything. Hypocrisy at its finest. Why would someone donate through Apple instead of directly to the Red Cross? I think it's nice that Apple is raising awareness, but it seems just as easy to do it directly to the Red Cross (plus then it's tax deductible). iTunes store gets more eyeballs than the Red Cross site. Also Apple already has a lot of credit card details on their servers. One click is all it takes. "no Thanks Apple, if your customers want to donate, they can come to me directly!" No, I didn't think so either. Think before posting. How is it generous of Apple allowing you to donate your own money? It's convenient, but not generous. As if I'd post what I do here. I'm like Steve. I give secretly. You should be defending me. Slow down kids. Stop the hate and donate. I love it when Apple does this. If I mailed a check to the Red Cross, my name would be get on a list and they'd spend at least 1/2 of what I sent them begging for more. They still may piss away 1/2 the money on begging campaigns, but at least they won't be filling my mail box with their crap. So Thanks Apple, for letting me donate in a secure and anonymous manner and still have confidence that the money will actually make it to the Red Cross. If I donate, I want to know where my money's going. For example, a rural family who lost their home would be great. But I wouldn't want my money going to some rich Manhattan-ite whose Porsche was flooded in their $600/month underground parking space. For that reason, I'm not donating. I'll wait for the next disaster. Sorry East Coasters!